This week I replaced my birdfeeder. The old one had gotten really beaten up with that huge snow storm and the subsequent wind storms we have had here this year. It never worked well anyway. It had mostly plastic and it blew sideways, dumping the birdseed in a windstorm. It got the seed stuck at the bottom with every rainstorm because the drain holes were ill placed and inadequate, and finally the place the birds stood broke off altogether. So I replaced it with a nice heavier and sturdier feeder made with brass, stainless steel, and glass (I hope the glass doesn’t break in future storms since we sometimes get a lot of wind here). It seems really nicely shaped for the birds to use too. The birds like it. I put it up a few days ago and already I have had a constant crew of various finches, mourning doves, black birds, cardinals, and the ever plentiful sparrows. 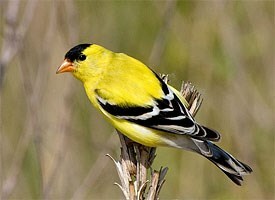 But the real treat was two bird varieties I have never had at my feeder (or seen there at least). I’ve seen them fly by occasionally but they never paid a visit when I watched until yesterday. Today, I had a bird visit that I have never had the pleasure of seeing. He not only visited, but he stayed long enough for me to get a real good look at him with my binoculars. 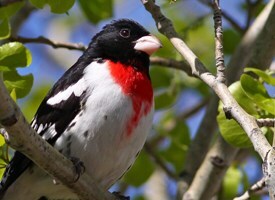 This picture is also from Cornell’s All About Birds. Sew happy everyone. May you all be so blessed and may birds and flowers bling up your space in this world. One of my wonderful mom’s favorite jingles was a song taken from an old movie that was as old as I am. It was You gotta stick to it tivity: You’re gonna do all right, you’re gonna do all right. She sang that to me when things I was trying to accomplish needed more work or went really awry. I can still hear her from time to time singing to me from heaven. 😀 I did see that movie, So Dear to My Heart sometime in my childhood and remember it a bit. 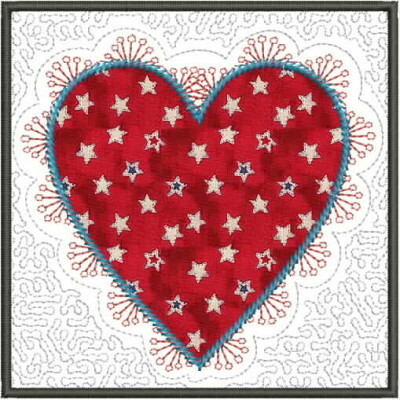 A little heart mug rug…just showing it because this story touches my heart strings. It didn’t seem like it at the time, but over the years I realized her singing that little jingle to me repeatedly was a gift that has served me well across the years, and most recently in my quilting. While working on the past several quilts I have had things go awry rather badly and I thought it may be the end for both of those quilt projects. Just this week, I started embroidering an element on my Hoffman Challenge 16 quilt and took extra care to place it perfectly along the cross hairs with my brand new laser cross hair light. 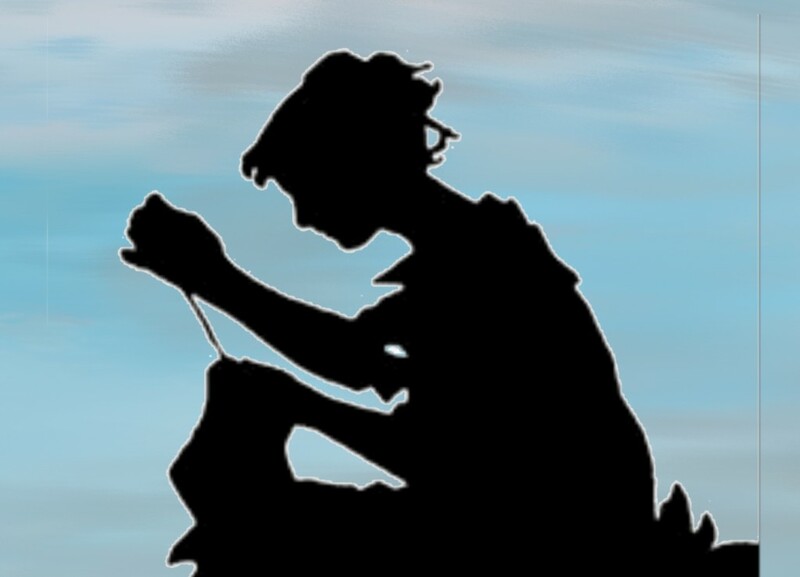 It was stitching wonderfully, until I looked at it and…. Gasp! I had put the hoop on sideways! Oh no. The element was turned a perfect 90 degrees wrong. I stopped the embroidery machine immediately, but it had already stitched quite a lot. I don’t know why I didn’t see it before I did. Well, I honestly wasn’t sure I would be able to fix it. Machine embroidery is very much harder to remove than ordinary machine stitching. So I started the process with my stitch remover and tweezers and realized I was simply not making any significant progress and I had put a small hole in the fabric. So I thought I would not be able to repair this quilt. But I was wrong. I decided the next morning to research what other people do when this happens and found a couple of videos on you tube of people using a hand held shaver and and another with an electric shaver-like device to remove such embroidery from the bobbin side. Someone noted in the comments that it was a regular small razor, which is what it appeared to me to be also. 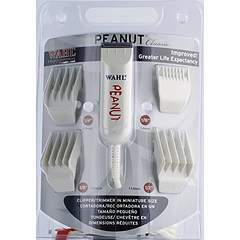 I bought a “Peanut” razor by Wahl, which is a very small palm sized razor and significantly less expensive than the embroidery specific razor. It came and I successfully removed the embroidery with no further damage to the fabric. Woohoo! I turned it to the back, braced it on my sewing ham to give it a solid rounded basis and shaved the bobbin side holding the razor kind of upside down as shown in the videos. I didn’t think it did anything until I turned it over and scratched at the embroidery with my tweezers, and it started coming up! It took me a couple of hours, but it all came and left no further damage than the small hole I made earlier. So yesterday I starched and ironed the area and restitched the embroidery off quilt on nylon veiling, which I will applique on. It will cover the small damage to the fabric with no problem and it looks wonderful. This event follows on the heels of my completing Drawing Nigh which I just finished after having multiple problems and nearly giving up on it more than once. Sew this is what I think. It is all right to abandon a project, but if you have spent hours and money on it, it can pay you to try to fix it. You may want to step back from it for a while and give it some thought. Do some research on what you can do to fix a problem you may not know how to fix, and keep on trying through one problem after another. If, in the end, you just can’t fix it to look like you want, you may be able to cut part of it into another project, or simply throw it away. But i suggest you don’t do that until you really try to fix it. You may end up with a wonderful end result. Tags: B.J. has more she wants to share but some of it is a secret project, Don't give up without trying something else first, heart tugs, I love comments., making the samples for the book is hard, What is that crazy B.J. doing now? Their eyes lose interest if I try to explain that I make wall quilts that are intended as art for the wall or that I am a competition quilter. I sometimes can’t help myself though. Sometimes I even continue talking even though I can tell they are not interested, or simply don’t understand, and tell them about the types of quilts I make and the equipment I use for it. But usually, I just smile and make a simple statement that I make art for the wall using fabric, threads, and quilting as my medium and stop trying to impress or explain. Usually they will start talking to me like some people do to the really extreme elderly…a softened, sweetened voice, and one of the nurses called me “dear.” I am 69. If you know my background as someone who worked more than 27 years in a job that took me all over the world to deal with tough situations, you would know how amusing (and slightly annoying) that is to me. Sew many people today still think that the hand sewn, hand quilted or tied quilt made from clothing scraps and backed by old sheets, and not quite accurately pieced, is the only “real”quilt (indeed, this is what my grandmother’s quilts are like). There are even those who think it is “cheating” to make quilts by machine, or “simply wrong” to paint a quilt. 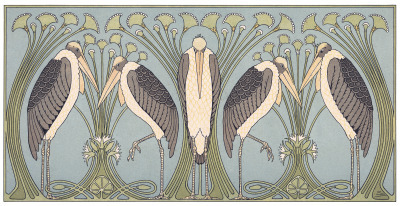 It is clear many have never seen the exquisitely crafted (by hand, machine, and both) quilts of all styles and methods such as can be found in quilt shows today. Why do I think educating the public about developments in the current quilt industry is important? I don’t feel I have to defend my current career. It isn’t going to help and only underscores some people’s view of me as I grow older (“sweet fat old lady”). I do think, however, that we need to attract new quilters.–young, middle aged, older (yes, continuing to attract the older quilt makers is just as important), men, women, and kids–that will help to keep the fabrics, threads, machines, laser lights, embroidery machines, and so on developing and available. Right now we have wonderful supplies for our craft. And truth be told, I probably have enough to last me the rest of my life in a pinch, but I do hope when I next need a batch of specially colored threads, a particularly interesting piece of fabric, or a new high-tech machine, they will be available, and still available when I reach my nineties and am still quilting. Sew happy everyone! Teach someone to quilt, or in the very least, teach someone about quilting today. This week I got a new toy. It’s a Perfect Alignment Laser 2 cross-hair lamp, which I am hoping will help me a lot in my studio especially with aligning embroideries and multi-hoop embroideries as I hoop them for my Bernina 830 LE and squaring up small quilt projects. I already had a laser square, which helps me square up my quilts and which I used just this week to make sure my quilt now named “Drawing Nigh” (the Waiting…2 quilt) was perfectly squared up. I found that the laser square didn’t quite do the job, however, because I have a lot of trapunto on that quilt that interfered with the lights, so I had to go back to rulers. I eventually got that done though it did take me quite an effort. Here is the first full picture of this quilt…Ta da!!! Sew today I’ve been doing some stitch-outs in my embroidery module of little animals for my Hoffman Challenge quilt. That quilt is a happy whimsical forest path with big funny flowers, butterflies all over the place, and big trees. I thought it needs some animals peaking out here and there and running or walking along the path. The embroidery module, of course, is a robot. Tags: B.J. has more she wants to share but some of it is a secret project, Having fun in my studio, I love these high tech tools, Waiting... series, What is that crazy B.J. doing now? Some of the sky colors after quilting. I finally finished quilting “Waiting…2”, and I blocked it, though I still need to do a little thread clipping and binding. During the quilting of the sky, which has been the most difficult part of this whole quilt, the thread colors became very important. The overall magic of the sky grew substantially different in coloring before and after the quilting, but to my chagrin I did not take a before picture. I did not understand how much difference it would make other than just a good quilting. I fell into a pattern of sculpting clouds and using thread colors to bring the sky to life. I already had added some painted colors to the sky, which I used for my guide to thread colors as I worked. The different thread colors really helped me realize the vision I had in my head for this sky, almost a thread painting. In the end, I surprised myself when I realized I had used over 30 thread colors of thread, including metallic silver and monopoly, for this quilt!!! I was as surprised that I had this many good threads in all these colors as that I had used that many on the quilting. What a happy thing that I have collected these over the past four or five years and kept them carefully, replacing colors as I used them up and adding a color set here and there. Most of the threads I used on the quilt are Superior Threads…Rainbow, King Tut, and Magnifico solids, with Bottom Line for the bobbin. I also have a couple of Isacord solids in there somewhere. I used gray bobbin thread (except for the monopoly) which goes well with the back, and I made sure the tension was as right as I could get it and I can’t see any gray on the top or any colors on the back where they should not be. This enabled me to easily change the color frequently. I did have a couple of incidents where I needed to take out some stitching because I forgot to change settings for the different types of threads. This is where a little notebook really comes in handy. I make notes about each type of thread (not each color). I took almost all day yesterday to get the quilt blocked and marked square (I haven’t yet cut it square, because I put the binding on using the marking before I do that). I got it all squared up according to my laser square and various other square ruler aids. Then I measured all the sides and it was 5/8″ longer on one side than the other and equally wide across top to bottom. Arghh!!! I ended up erasing all the marks and starting over (twice) until I got it right. It’s a mystery…LOL. Judges really don’t like it if it isn’t square and neither do I. I can only think that the considerable bit of trapunto I placed under the cliffs had an effect on the square “measurers”. It seems the original marks were a little bit off on both the top line and the bottom line. Anyway, it’s marked square now, lined up to the water horizon line, and I even took out a different color marker to make the final marks clear. Hooray! ready to bind. Sew Happy Everyone! Have a wonderful weekend and rest of the week. Try a little quilting with color varieties and see what you think. Tags: Having fun in my studio, I love comments., Waiting... series, What in the world is BJ doing! 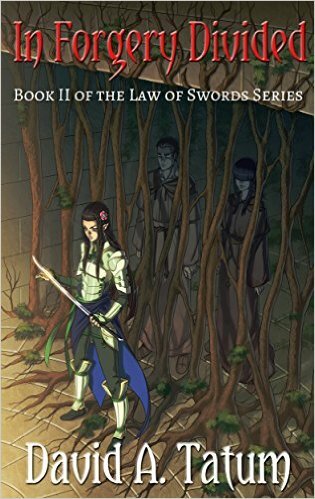 Yesterday my son David A. Tatum released his third novel, which is really the second book in his ongoing “The Law of Swords” fantasy series In Forgery Divided. I’m a proud mom and happy reader. It is currently available at Amazon for Kindle ereaders and will show up over the next few days in other formats. In about three or four weeks, his print version will be available from Amazon. His books are beautifully written and well researched (yes, writing a fantasy novel requires research on history and other points…history of building, roads, clothes, food, and on and on). They have been well edited. So take some time out and read his books. I, too, am about to complete a long-term project–my Waiting…2 quilt (I’m considering what to name it now). I love the actual quilting of a quilt. It reminds me of reading an exciting book by a favorite author in which I really want to know what happens next, read as much as I can find time for, and feel just a little let down when I finish the book because there isn’t anymore of the story. 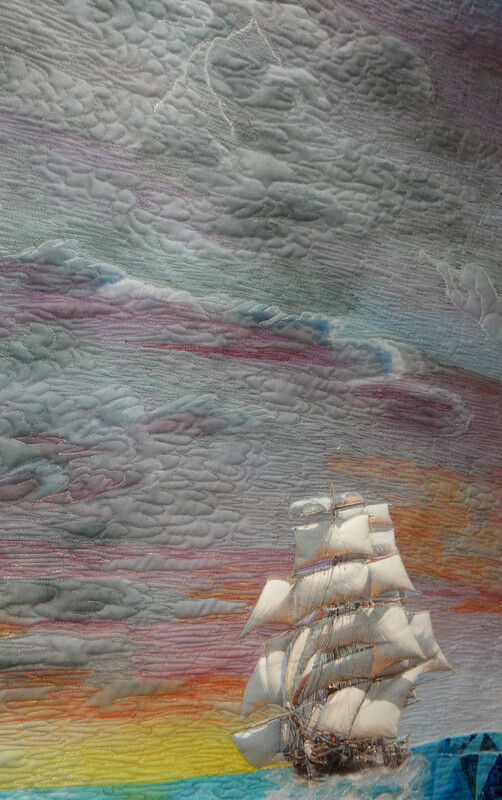 I’ve gotten the sky and sea quilted, except for adding the Angelina Fiber wave crashes and sprays. 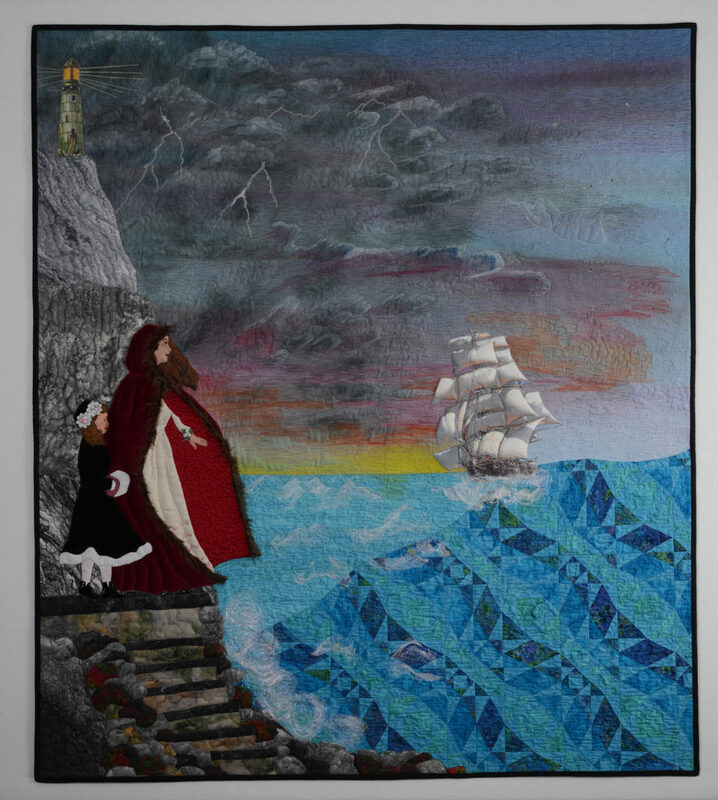 I have completed quilting the woman and the little girl, and gotten the cliffs done. Sew I’m thinking I will finish in the next day or two. It is a wonderful blessing that we are both able to do these things. It is my hope and prayer that David’s books will sell well. This is his chosen career. He has no other, and his books are wonderful. It is my hope and prayer that my quilts will be well received at shows, in the quilting and art communities, and elsewhere. This is my chosen retirement career. We both work to bring joy, refreshment of mind and spirit, and just plain fun to others. David works to bring money to support himself, too. So I would sew appreciate your prayers for our success, and your buying of his books. Sew happy everyone. May your projects be happily finished and bring happiness to you and others.